In his efforts to promote his “opportunity for all” jobs plan, President Barack Obama visited a General Electric gas engine facility in Waukesha, Wisconsin on January 30, 2014. This engine plant produces engines that are designed specifically for use in gas and oil fields, which are some of the most demanding conditions that engines often operate under. The significance of this visit by President Obama is that manufacturing is an important part of our nation’s economy. General Electric, which is a known innovator of all types of engines, employs over seven hundred individuals at their Waukesha engine plant. In fact, a machine operator named Reggie Troop had the distinct honor of introducing President Obama to his fellow employees, members of the media and others in attendance. If you visit the official White House website, you can see a picture of President Obama viewing a crankshaft. 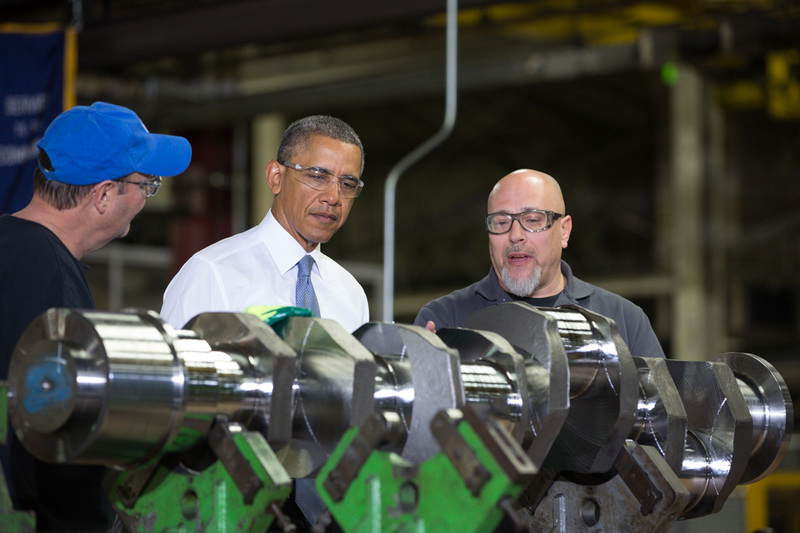 The full story on President Obama’s visit to this engine plant may be viewed here. Although it is great that the President of the United States is touting our nation’s manufacturing capabilities, and seeks to strengthen them, many of the aftermarket crankshafts used in performance applications are forged overseas. For example, many 4340 forged steel crankshafts are produced in China and some are finished here in the United States. It is our hope that the President will look at current trade agreements and evaluate their impact on our manufacturing sector. Both General Electric and President Obama deserve our praise for their roles in helping individuals enter job training programs that require a great deal of technical knowledge. With nearly one third of the workers at GE’s plant becoming eligible for retirement in the next few years, many employment opportunities will soon exist for young machine operators and machinists that are interested in pursuing a career with an innovative company that produces highly specialized engines. This entry was posted in News on February 3, 2014 by admin.